I had never heard of Freddie Pimm until I was asked to review this book by Inter-Varsity Press. He is a doctor by profession and this is his first published book – and I am a little jealous that I didn’t write it! Freddie tackles some tough questions about the church and its place within society, carefully bringing the central, important message of God’s Kingdom (often a neglected point at the expense of talking about repentance and forgiveness) to the forefront. Freddie breaks the book down into digestible chunks by examining the symptoms and posing a diagnosis of why the good news of the gospel is often found to lack the transformative edge that it should have; the church should be sharing the good news of Jesus for a society that is crying for change. Each chapter also has a concise conclusion which I found helpful as it captures the key points he conveys making it easy to refer to and remember. He remains humble throughout – he does not point the finger at the church in a condemning way, but asks honest questions about himself and his role as a Christian, as well as the role of the wider church, in bringing about transformation in everyday life. I love how Freddie uses his professional experience as a doctor to draw parallels between sickness that he has studied firsthand with the sickness and ailments that he sees within the church today. It is written in a very fun, clever style and like a caring, knowledgeable doctor, Freddie does not abandon the sick. He carefully looks at the underlying problems and suggests helpful, positive ways forward – from symptoms to diagnosis to cure. He rightly considers the importance of personal transformation in discipleship and looking outwards to those outside of our church whilst being vulnerable and real to them. I have already told many people about this book because I feel that it carries an important message that many are asking about the church. As the church seems to be more and more alien to the culture that surrounds it, there is a need for it to be examined both individually and corporately. The gospel brings healing, transformation and real, lasting change. When we start taking it seriously and addressing the root cause of the problem, the church will begin look and be more healthier from the inside looking out as more people realise that they are welcomed into God’s Kingdom right now. This is good news. 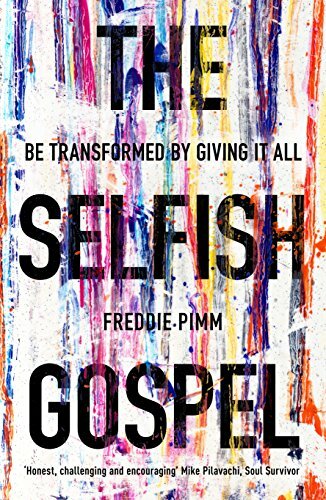 The Selfish Gospel (published by IVP) is available now from Amazon, Eden, and can be ordered from local Christian bookshops. Sounds very interesting, Ruth. I’m coming to realise that Christians need to dig deeper if they’re going to get the message across, and that includes everybody in the church, and Christian writers too. Adrian Plass was talking about honesty in the Christian message at Scargill, admitting where the Christian good news doesn’t work for you and thinking it through honestly. I’m currently reading ‘Rooks at Dusk’ by Chick Yuill, about a clergyman who lost his faith and was then committed adultery. It’s heart-churning stuff, and I’m only at 60% so far.